MANILA, Philippines - State weather bureau PAGASA announced on Saturday, September 13, 2014 that 'Bagyong Luis' (international name: Kalmaegi) has intensified while moving towards Cagayan-Isabela area. Public storm warning signal No. 1 was raised over five (5) South and North Luzon areas. Winds of 30-60 kph is expected in at least 36 hours in the following areas (Public Storm Warning Signal 1): Isabela, Cagayan, Aurora, Quirino, and Catanduanes. PAGASA said that at 10:00 AM today, the center of 'Bagyong Luis' was estimated based on all available data at 456 km East Northeast of Virac, Catanduanes (14.6°N, 128.4°E). It has maximum sustained winds of 95 kph near the center and gustiness of up to 120 kph. It is forecast to move West Northwest at 17 kph. Typhoon Luis is expected to be at 252 km North Northeast of Virac, Catanduanes by tomorrow morning (September 14) and at 27 km West Southwest of Tuguegarao City by Monday morning (September 15). 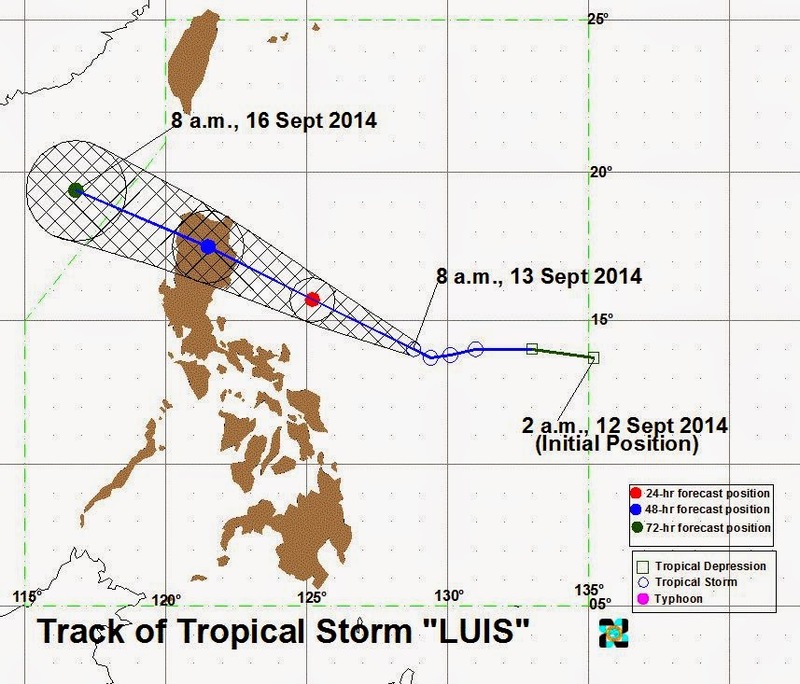 By Tuesday morning, it is expected to be at 421 km West Northwest of Laoag City. Residents in low lying and mountainous areas under signal #1 are advised against possible flashfloods and landslides. The estimated rainfall amount is from 7.5 – 20 mm per hour (heavy - Intense) within the 400 km diameter of the Tropical Storm. The combined effect of Tropical Storm “Luis” and the Southwest Monsoon (Habagat) will bring light to moderate rains and thunderstorms in CALABARZON, MIMAROPA, Bicol Region and Visayas. Fishing boats and other small seacrafts are advised not to venture out into the Eastern seaboard of Southern Luzon, Visayas and Mindanao.